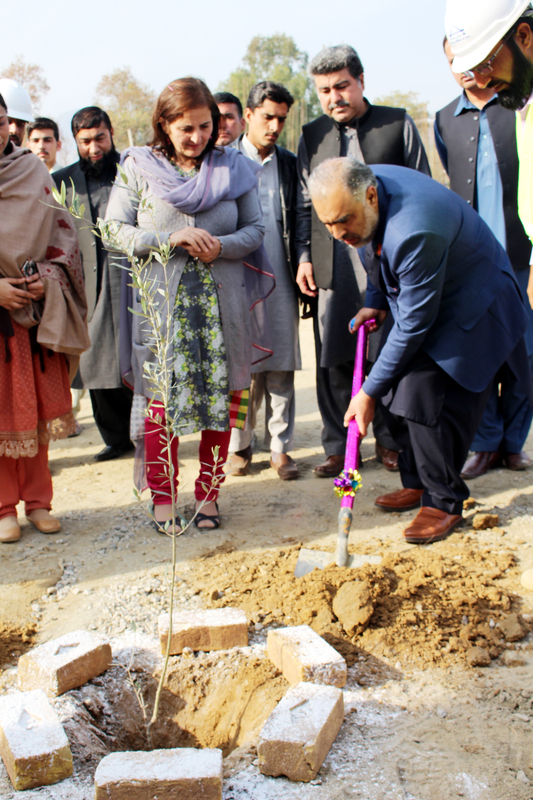 Honourable Speaker Khyber Pakhtunkhwa Assembly, Mr. Asad Qaisar, visited Women University. Honourable Speaker Khyber Pakhtunkhwa Assembly, Mr. Asad Qaisar, visited Women University, Swabi to extend his wholehearted gratitude to Vice Chancellor, Prof. Dr. Khanzadi Fatima Khattak for receiving a prestigious United Kingdom based Royal Society Fellowship. The Honorable Speaker appreciated Prof. Dr. Khattak for her exceptional contributions to Science and Humanity and for being the first Pakistani female, who achieved this high status award. 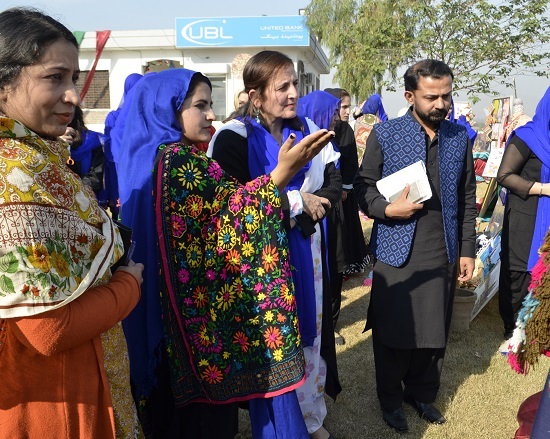 Later, he visited the Women University Swabi new campus. He commended the progress of construction work. A team of PCSIR comprising of Dr. Farid Ullah Khan (Director P & D) and other eight experts visited Women University (WUS) on 02-01-2018 (Tuesday) and met Honorable Vice Chancellor Prof. Dr. Khanzadi Fatima Khattak. The purpose of the meeting was developing collaboration in research & development, conduct seminars, workshops on medicinal plants, Marble Technology, Women entrepreneurship and Food Processing. Furthermore, to prepare the combine research project on Post Harvesting losses and other services whereby many horizons of mutual facilitation and development will be inculcated accordingly between the Women University Swabi and Pakistan Council of Scientific and Industrial Research (PCSIR). 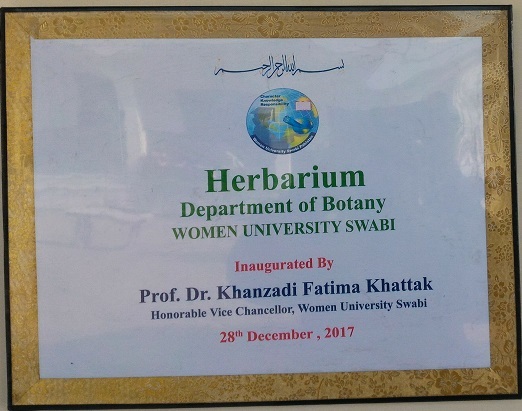 Inaugural Ceremony of Plant Herbarium in Women University Swabi was held on 28th December, 2017. 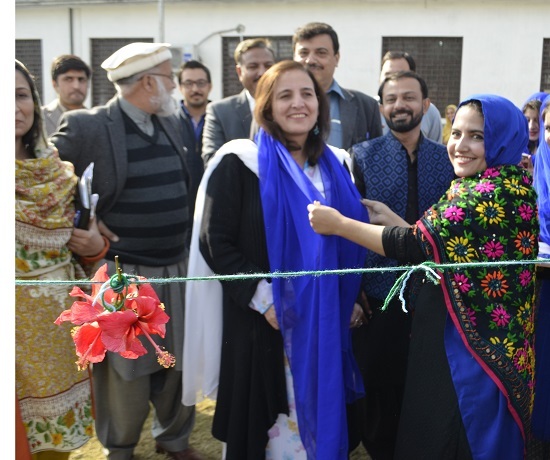 The Herbarium was inaugurated by the Honorable Vice Chancellor Prof. Dr. Khanzadi Fatima Khattak which was established by Dr. Muhammad Wahab, Assistant Professor in Department of Botany. In the establishment of said herbarium, students of MSc 2nd semester collected 2000 plus plant specimens from District Swabi and adjacent areas under the supervision of Dr. Wahab. The specimens were preserved and well mounted on herbarium sheets as per international standard. The effort was highly appreciated by Honorable Vice Chancellor and urged to collect more plants specimens from entire country in order to explore commercially important medicinal plants. 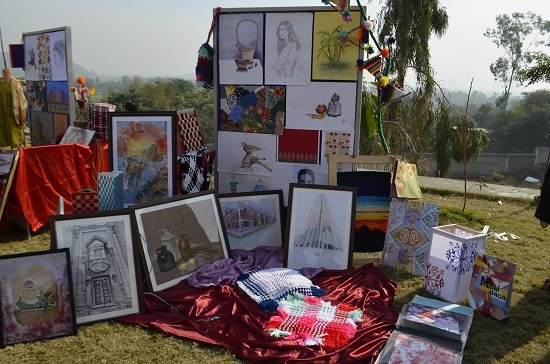 Art and Design Department Women University Swabi has arranged an event consisting of three exhibitions, titled "Woven Glob", One Thousand Tales of Swabi and Wall of Historic Arena, on 23rd November. The Worthy Voice Chancellor has commenced the event. In Woven Glob students of Textile Design exhibited their work which was done in two semesters. In this work students successfully jelled in the creativity with the commercial suspect and proved that their skill and creativity is not less than anyone. In this show they represented all range of home accessories including rugs, table lamps, cushions, dresses and so many. To produce these works, they used different techniques like batik, tapestry, weaving, and block printing etc. Their work showed that students have best expertise in these techniques and their work can compete at national and international level. They have ability to bring a revolutionary change in textile industry. The second exhibition was the "One Thousand Tales of Swabi" . It was photographic show. 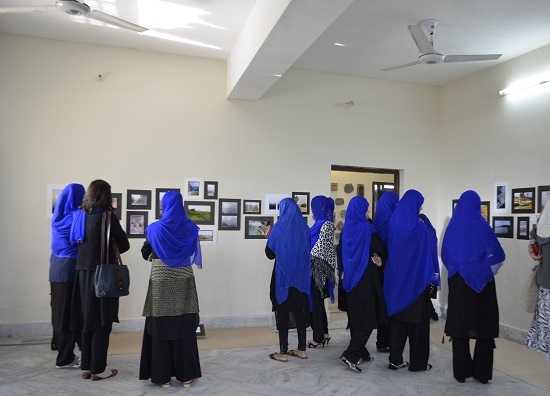 In this exhibition students explored a lot of beautiful aspects of Swabi. They highlighted many beautiful landscapes as well many cultural elements. Students also captured the daily life activities of a common man such as woman making food at home in gloomy evening. Children,s playing in dust. A man with domestic animals and many more. Third show was "a wall of historic Arena". In this students represented the evolution of art from the Stone Age to modern age. Students selected stone as a medium for this they carved the stone with great mastery. 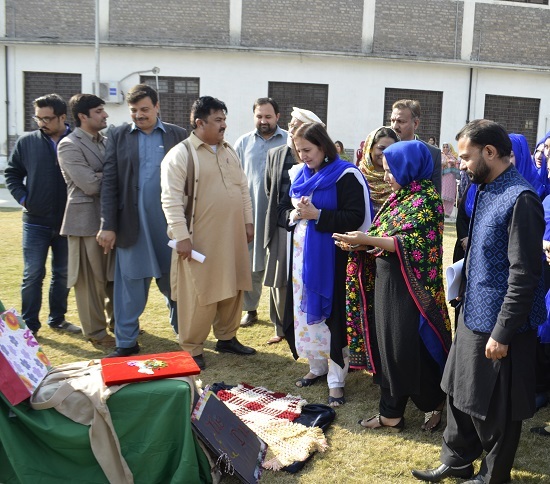 At the end of this event Worthy Voice Chancellor highly appreciated and eulogized the admirable efforts of students and faculty of Art and Design Department and announced one lack rupees as an honorarium for the department of Art and Design Department. 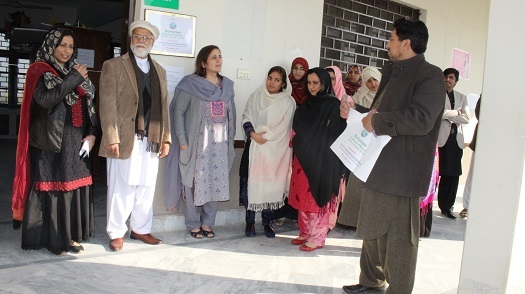 A one-day awareness seminar on Breast Cancer was organized at Women University Swabi. 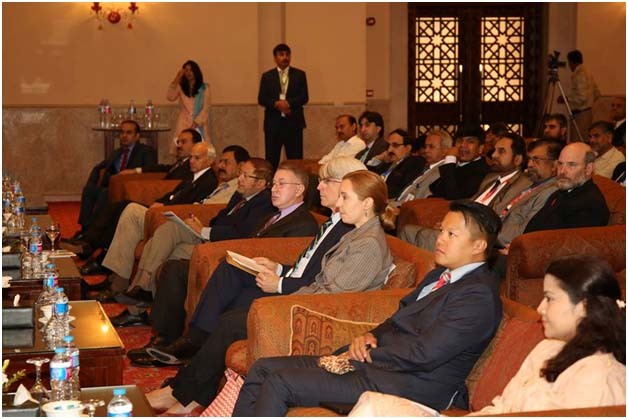 Dr. Lubna Jillani, Senior Medical Officer, Shaukat Khanum Hospital, Peshawar was the key note speaker on the occasion. Dr. Jillani pointed out that breast cancer is a widespread disease among women folkand is one of the major reasons of death to them. She said that cancer can be prevented and cured, if it is diagnosed at early stages. She also talked about the preventive measures. Dr. Khattak, the honorable Vice Chancellor of Women University presented a shield to the speaker. 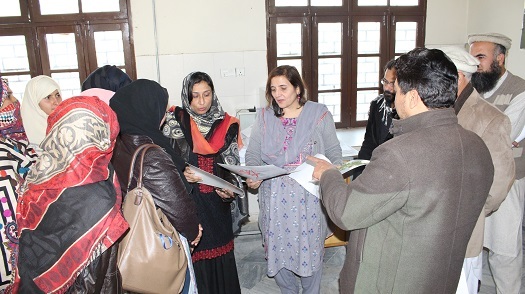 She appreciated the efforts of Shaukat Khanum Hospital, Peshawar for educating girl students about this deadly disease.She stressed on the need to create awareness among young women over the deadly disease.She advised that no one should hesitate in discussing health issues, so that this deadly disease could be prevented at early stages.Dr. 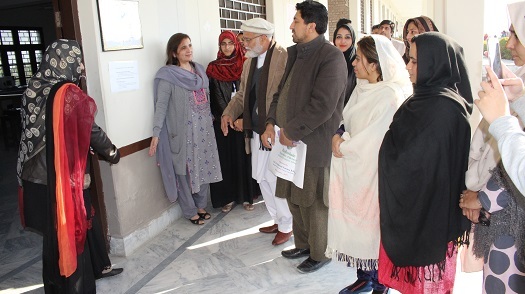 Khattak also said that students of Department of Psychology of the University can provide psychological councellling services to cancer patients at the Hospital. 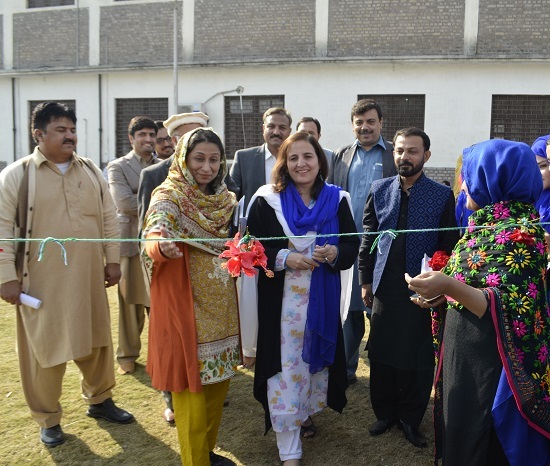 Dr. Lubna Jillani thanked the Women University Swabi for their co-operation and facilitation. 1st meeting of Board of Studies of Department of Chemistry was held in the committee room of the University. The meeting was chaired by the honorable Vice Chancellor, Women University Swabi, Prof. Dr, Khanzadi Fatima Khattak. 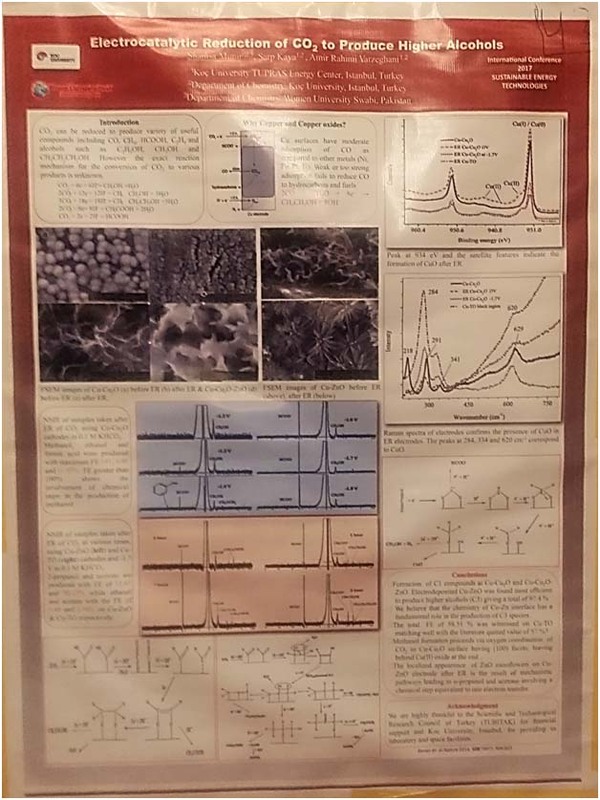 The meeting was attended by Prof. Dr. Yousaf Iqbal, Ex-Director, Institute of Chemical Sciences, University of Peshawar; Dr. Shabbir Ahmad, Associate Professor, Department of Chemistry, Islamia College University, Peshawar; Dr. Salma Gul, Assistant Professor, Head of Department of Chemistry, Dr. GulnazParveen, Deputy Director Academics; (WUS) along with Six PhD faculty members of the Department. The Honorable Vice Chancellor urged to modify the curricula as per the local needs, international standards and HEC guidelines. Scheme of studies and course contents for BS, MPhil, MPhil leading to PhD and PhD programs were finalized. Other important matters regarding quality assurance and research programs of the Department were thoroughly discussed. 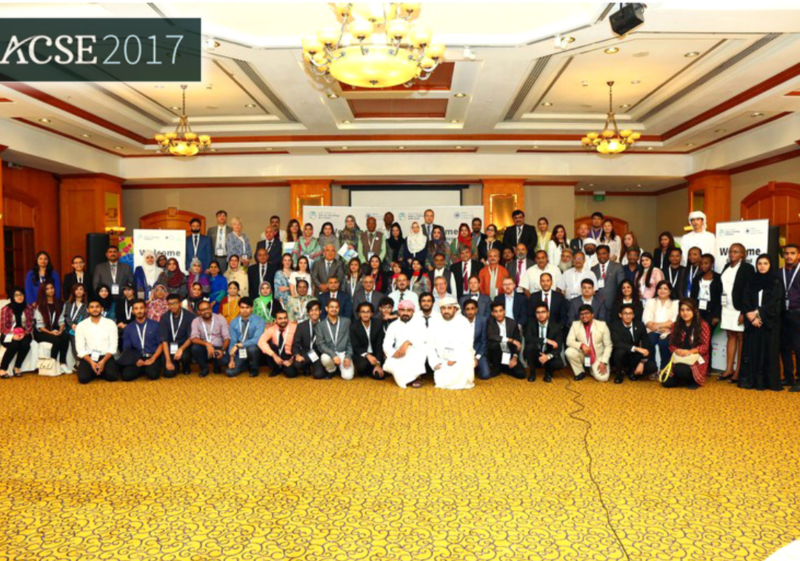 Ms Gul Rukh (lecturer Statistics) presented her research paper at World Conference on Science, Technology & Medicine held at Dubai, UAE on 12th - 14th August 2017. It was the 4th Annual Conference of the ACSE. This international conference was hosted in collaboration with UTM, CUST, PAS, and PCST. Highly experienced industry experts addressed important trends and developments. Prof. Dr. Gazi Mahabubul Alam, Vice Chancellor, Central University of Science & Technology gave the welcome speech to all the participants and listeners. 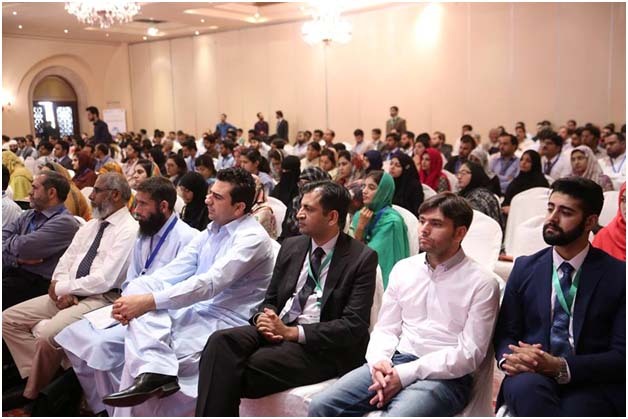 Professor Dr. Anwar-ul-Hassan Gilani, Chairman, Pakistan Council for Science and Technology motivated and encouraged the young participants. The program had some plenary lectures and guest lectures. Then few workshops were designed to provide hands-on training in several important practical areas. 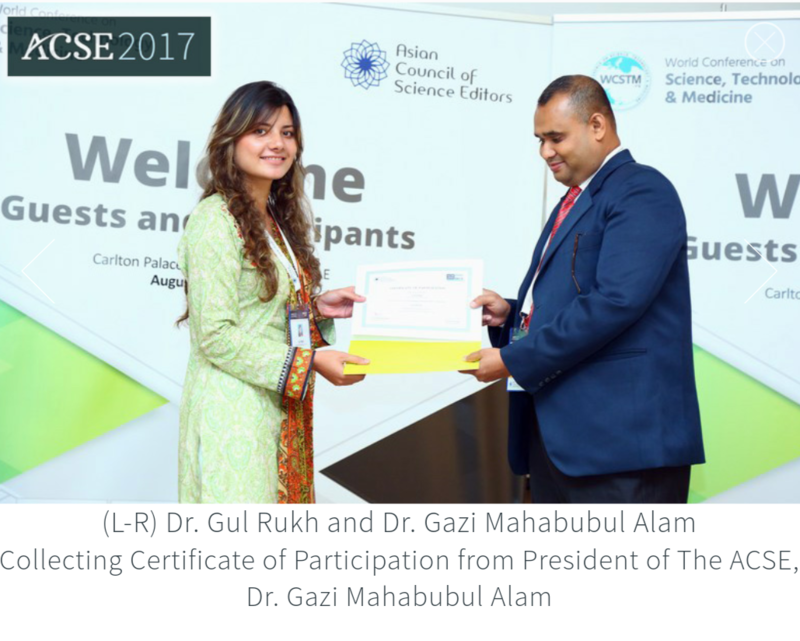 Ms Gul Rukh was awarded with the Membership certificate from Asian Council of Science Editors. 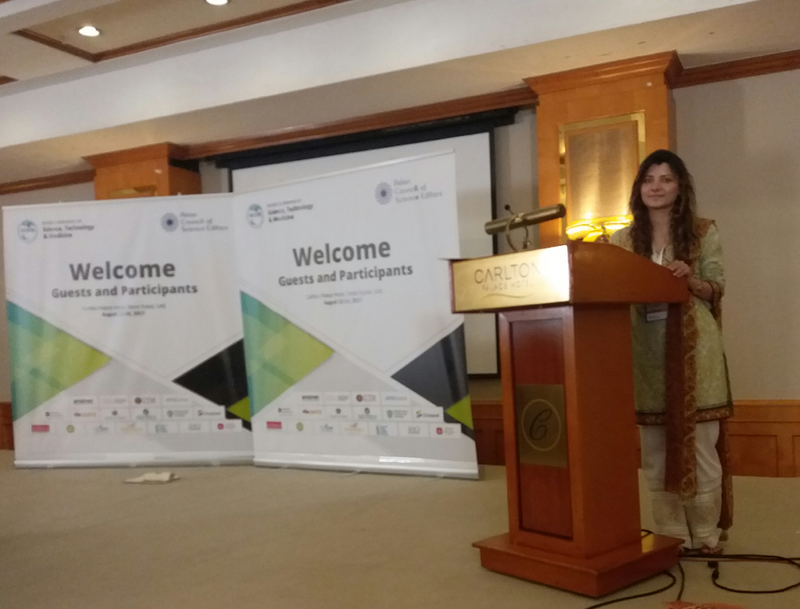 Dr. Shamsa Munir, Assistant professor Chemistry department, received 2nd prize in theme based poster competition at â€œInternational conference on sustainable energy technologiesâ€ held at Serena hotel Islamabad from 12-13 September 2017. 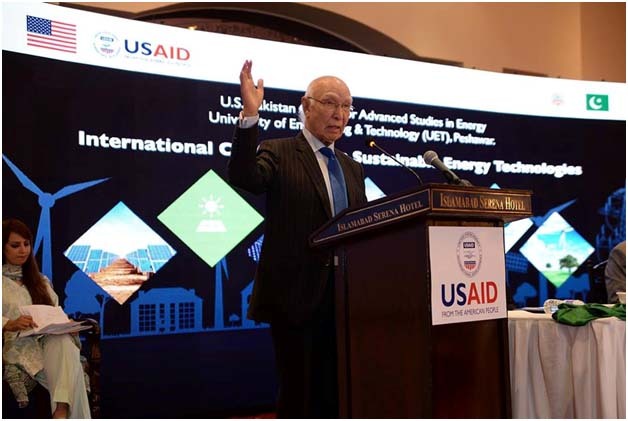 The Conference was organized by US-Pak Center of Advance Studies in Energy, UET Peshawar(USPCAS-E). 1. Approval of Curriculum for BS ( 4 years) Program and Masters ( 2 years ) Program. 1. Dr. Qasim Marwat, Chairman, Board of Technical Education, Khyber Pakhtunkhwa, Peshawar. 3. Dr. Shakeel Ahmad, Assistant Professor, Center for Policy studies at Comsat University, Islamabad. Important decisions were made regarding Rules of Business for Affiliation Committee, Inspection Committee for affiliation and its working, affiliation of female colleges, examinations and admission. The committee granted the approval of affiliation of Government Girls Degree College Yar Hussain with Women University Swabi. Important decisions were made regarding affiliation of female colleges, examinations (private and regular), admission, accreditation of academic programs of departments of Computer Science and Law with relevant Education Accreditation Council. The chair urged all faculty members to take all necessary steps to improve the quality of academic and research programs to promote quality higher education besides inculcating ethical and social norms and values. It is notified for the information of all staff and students that univeristy will remain closed on March 23 ,2017 on eve of Pakistan Day. An MoU has been signed between Women University Swabi and Bach Khan Medical Complex on 30th January, 2017. This MoU is to develop collaboration in academic, research, and outreach services whereby many horizons of mutual facilitation and development will be inculcated accordingly between the Women University Swabi and Bacha khan medical complex Mardan. 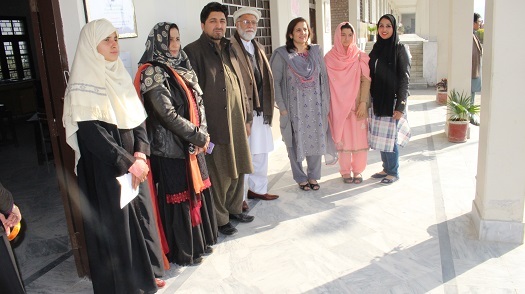 The second meeting of the Syndicate of Women University Swabi was held on 15th December 2016. The meeting was chaired by Prof. Dr. Khanzadi Fatima Khattak, Vice Chancellor and attended by Mr. Justice Said Maroof Khan, Mr. Nasir Aman, Deputy Secretary, Establishment Department, Government of Khyber Pakhtunkhwa, Mr. Muhammad Naseem, Deputy Secretary, Finance Department, Government of Khyber Pakhtunkhwa, Mr. Arifullah Treasurer and Mr. Qadir khan Registrar Women University Swabi. The Syndicate recommended the first budget of the university and creation of regular budgetary posts for faculty, administrative and support staff. Various important decisions were taken regarding academic and research activities at the university. The third Meeting of the Academic Council of Women University Swabi was held on 6th December 2016. The meeting was chaired by Honorable Vice Chancellor; Prof. Dr. Khanzadi Fatima Khattak. Meeting was attended by DD academics, Dy. Registrar and All HODs of the departments. The council discussed various issues regarding Academic programs, examination matters, research and thesis processing. The council constituted various committees for dealing these matters. . The 7th meeting of the Technical Review Committee (TRC) was held on December 5, 2016 at 10:00 AM in the Meeting room of Women University Swabi Gulu Dehri, Swabi. The meeting was chaired by Honorable Vice Chancellor Prof. Dr. Khanzadi Fatima Khattak. The meeting was attended by Mr. Imtiaz Hussain Gillani (Project Director UOT), Mr Zaman Marwat Chief Planning Officer, Highier Education Department, Engr. Hassan. S Haqqani Director Works GIKI Topi, Engr. Muhammad Akhtar, Atomic Energy Commission along with Representative of the Consulting Firm Mr. Asghar Khan Yousafzai ( MD, Royal Associates Consultants). Engr. Saadat Ali Khan (Deputy Director Works/P&D, WUS) ,Engr. Qazi Hashem Jan (Sub Engineer Electrical, WUS),Mr. Arifullah khan (Deputy Director Finance, WUS) were also present. In Meeting the Master plan of Women University Swabi new Campus on newly demarked land was discussed and consultant was directed to revise the master plan according to newly demarked land. Also some other related Technical issues were discussed and decision taken. The committee members also paid the visit to newly demarked proposed site at kotha. The 1st meeting of Finance & Planning Committee of Women University Swabi was held on November 23, 2016 at (01:00 PM).The meeting was chaired by Prof. Dr. Khanzadi Fatima Khattak, Vice Chancellor. Participant of the meeting were Dr. Khalid Khan, Additional Secretary Higher Education Department, Khyber Pakhtunkhwa, Mr. Syed Samer Sibtain, Dy. Director (Budget) Higher Education Commission, Islamabad, Mr. Muhammad Javed, Budget Officer, Finance Department, Khyber Pakhtunkhwa and Mr. Arif Ullah, Treasurer, Women University Swabi. In the meeting zero deficit budget was recommended for FY 2016-17, Various posts for faculty, administrative and ministerial were created and other important decision were taken regarding financial matters of university. A meeting of the Graduate Studies Committee of the Department of Chemistry was held on Wednesday 28th September, 2016 at 10:00 am in the meeting room of the Women University Swabi. Following members attended the 1st Meeting ofGraduate Studies Committee (GSC) of the Department of Chemistry. Prof. Dr. Khanzadi Fatima Khattak, Vice Chancellor, Women University Swabi. Prof. Dr. Yousaf Iqbal, Senior Expert, Institute of Chemical Sciences, University of Peshawar. Prof. Dr. Hamid Ullah Shah,Senior Expert, Department of Agriculture Chemistry, The University of Agriculture Peshawar. Dr. Syeda Sohaila Naz, Convener, Assistant Prof., Department of Chemistry, Women University Swabi. Dr. Andaleeb Azam, Senior Member, Assistant Prof., Department of Chemistry, Women University Swabi. Dr. Salma Gul, Senior Member, Assistant Prof., Department of Chemistry, Women University Swabi. Dr. Samreen Saleem, Assistant Prof., Department of Chemistry, Women University Swabi. Ms. Salma Bibi, Lecturer, Department of Chemistry, Women University Swabi. Ms. Shah Seloni, Lecturer, Department of Chemistry, Women University Swabi. Ms. Asma Ahmad, Lecturer, Department of Chemistry, Women University Swabi. The 6th meeting of the Technical Review Committee (TRC) was held on September 8, 2016 at 11:00 AM in the Meeting room of Women University Swabi, Swabi. The meeting was chaired by Honorable Vice Chancellor Prof. Dr. Khanzadi Fatima Khattak. The meeting was attended by Mr. Imtiaz Hussain Gillani (Project Director UOT), Mr. Muhammad Imran (Assitant Engineer, University of Swat), and Mr. Hameed Hassan (Consultant) along with Representative of the Consulting Firm Mr. Asghar Khan Yousafzai ( MD, Royal Associates Consultants). Engr. 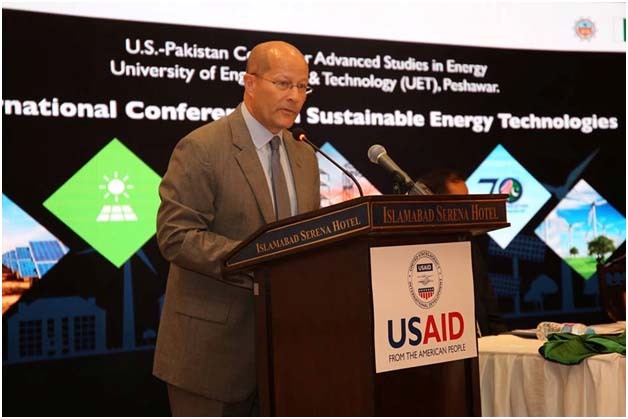 Saadat Ali Khan (Deputy Director Works And P&D, WUS) ,Engr. 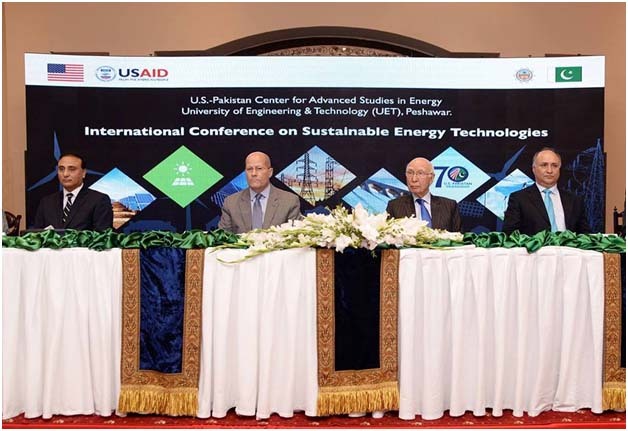 Qazi Hashem Jan (Sub Engineer Electrical, WUS),Mr. Hamid Mehmood (Deputy Director Finance, WUS),Mr. Qadir khan (Deputy Director Administration, WUS) were also present. The Committee visited for the first time to Proposed site at Kotha college. In Meeting the Master plan of Women University Swabi new Campus was thoroughly reviewed . First Graduate Studies committee meeting of department of Botany of Women University Swabi, Swabi was successfully held under the kind supervision of Vice Chancellor, Prof. Dr. Khanzadi Fatima Khattak, today on 7th August, 2016, at 11:00 AM at the Main campus of the university. The members of the meeting were.
. Dr. Ghulam Dastagir, Associate Professor of Botany University of Peshawar.
. Dr. Gulnaz Perveen, Assistant Professor of Botany, department of Botany, Women University Swabi.
. Dr. Naila Mukhtar, Assistant Professor of Botany, department of Botany, Women University Swabi.
. Dr. Shahida Naveed, Assistant Professor of Botany, department of Botany, University of Peshawar. Classes for New Semester of M.Sc & BS will commence on 1st Aug-2016. Result of BS has been declared by exam section.